Lt. Col. Eric Smith, the 58th Fighter Squadron director of operations, secures his helmet for testing prior to stepping to the F-35A Lightning II joint strike fighter for its first-ever training sortie March 6 at Eglin Air Force Base, Fla. Smith is the first Air Force pilot qualified to fly the F-35. When the Jjoint Sstrike Ffighter, the F-35 Lightning II, finally takes to the skies on its first official mission, it will be one of the most advanced and one of the most expensive planes ever. And the pilots flying the aircraft will be wearing the most advanced and most expensive helmet ever. The helmet will give pilots quicker access to the information they need to see and has special cameras to "see" through the bottom of the plane. But it will cost an estimated $400,000 per helmet — more than four times as much as the Air Force paid for head wear for other aircraft such as the F-16. Helmets for all the F-35s scheduled to be purchased will cost at least $1 billion, Air Force Times estimates. The helmet makes use of six cameras embedded in the skin of the plane to give pilots a 360-degree view of the surrounding airspace, including enabling them to "look through" the floor of the plane. Plus it has advanced night-vision capabilities built in; and the heads-up-display projects directly onto the visor, putting information like altitude, speed and targets right in front of the pilots' eyes. It is also larger and heavier than helmets for other aircraft. And that has spawned its own set of problems. One pilot has complained that it bangs into the canopy, and recent tests have shown that it can make ejecting more dangerous for lighter pilots. As a result, the F-35 program office has ordered a new lighter helmet which will be available in 12 to 18 months. And just like everything else about the F-35, the helmet has led to a split on whether the cost is justified for new advanced systems or a waste of taxpayer dollars. Air Force Chief of Staff Gen. Mark Welsh said the helmet is the key to giving pilots capabilities they haven't had before. "The helmet is much more than a helmet, the helmet is a workspace," he told Air Force Times. "It's an interpretation of the battle space. It's situational awareness. Calling this thing a helmet ... we've got to come up with a new word." Pentagon and defense contractors insist that reported problems with the helmet have been fixed. But the high price tag has left many oversight experts and members of Congress wondering if the tab is worth it. "The designers of this have come up with a very complicated, very finicky solution for a relatively simple problem," said Dan Grazier, with the Project on Government Oversight. Grazier, an expert at POGO's Center for Defense Information, said he believes the helmet is "symptomatic of a larger problem" — that designers are trying to stick too many features on the plane and its systems. "We need to stop trying to make this thing all things to all people because it winds up becoming useless to all people after a while," he said. "The characteristics of a good fighter plane are very different than the characteristics of a good close-air support aircraft." Rockwell Collins, a subcontractor working on the helmet, directed all questions to Lockheed Martin. The company also declined to provide cost data on the helmet, but said that the information had already been made public by other reporting. It directed Air Force Times to a Washington Post article that found the cost of each helmet was $400,000. Air Force officials confirmed that $400,000 was an accurate estimate, but noted that the helmet cost is incorporated in the overall cost of the plane, so pulling out a specific cost for a specific component can be difficult. Each helmet is created uniquely for each pilot, and built to match the measurements of the pilot's head to ensure it fits comfortably and snugly. That means that every single person who flies an F-35 will have his or her own helmet. The Pentagon is expected to buy roughly 2,400 F-35s, with 680 going to the Navy and Marine Corps and the rest going to the Air Force. If each helmet costs $400,000 and each of the 2,400 F-35s has a pilot, the bottom line cost for helmets is $960 million — not taking into account that pilots retire and are replaced by pilots with different-sized heads. Issues were raised anew about the plane earlier this year, after a test flight pitting the F-35 against an F-16. An internal Lockheed Martin memo, first leaked by the website "War is Boring," showed that the F-35 was having difficulty dogfighting against the older aircraft. "The F-35 was at a distinct energy disadvantage in a turning fight," the report said, and when it came to trying to operate the aircraft in a high angle of attack, "it wasn't effective for killing or surviving attacks," the report said. The problems extended to the helmet as well. The internal memo noted the pilot's helmet kept smacking into the canopy when the pilot tried to turn around. "The helmet was too large for the space inside the canopy to adequately see behind the aircraft," the report said. "There were multiple occasions when the bandit would've been visible (not blocked by the seat) but the helmet prevented getting in position to see him." Indeed, one of the recommendations on the report was to "consider improving rearward visibility by creating more space for helmet motion." And the problem had a second side-effect. "Whenever the helmet was pinned against the canopy, the pilot continued to strive to turn his neck," the report said. That means the information on the Heads-Up-Display needed to fly and fight was no longer right in front of the pilot's eyes. But Lt. Col. Michael Gette, commander of the 61st Fighter Squadron at Luke Air Force Base, Arizona., and an expert on the F-35, said he's never noticed the issue. "I've been flying this airplane for a couple of years now and I do not have a problem with that," he said. "There's plenty of room to maneuver it in the cockpit. There's a little bit of a learning curve. The equipment is brand new, just takes some getting used to. And once you figure out how to get it fit correctly and how to get all the cords routed correctly in the airplane and fly it for a while it becomes a non-issue." Gette said the F-35 is still undergoing testing and evaluation, and that some difficulties are to be expected. "This is a brand new airplane. Obviously as a jet first comes out there's going to be some limitations as they're testing the airplane," he said. "Like with the airplane, the helmet is a pretty big leap in technology. We're trying to do things with the helmet that's never been done before." At one point, in 2011 the Air Force had such little confidence in the helmet that it contracted another company — BAE Systems — to begin creating an alternative. The original helmet, then in its Gen 2 iteration, was facing criticism that the visor-projection system wasn't working. Misalignments meant blurry images and some reports of pilot headaches, and there were issues with the heads-up display not properly displaying all needed data. But Lockheed Martin and its subcontractors were able to fix the problems enough to satisfy the Pentagon, which canceled the second helmet in October 2013. Officials at both the Air Force and Lockheed Martin have acknowledged early problems with getting all the helmet's systems operational, but said they believe those issues are in the past. Welsh said the pilot response to the helmet has been positive. "All the people flying the airplane — from the time I came into this job three years ago and started asking about the problems I kept hearing about with the helmet — not a single one of them has said 'Yeah, I don't want to use it,'" Welsh said. "It's a pretty incredible capability, and they adapt very quickly to it." Billie Flynn, a Lockheed F-35 test pilot, said the headgear has been a big hit for operators. "Every single pilot that's ever flown with this helmet loves the helmet," he said. Because of the information projected onto the visor, pilots have quick access to the data they need to fly the plane, Flynn said. "It becomes intuitive that wherever you want to go, that information's in front of both eyes," he said. "It's that split-second less time required to be able to look and target and all the information's directly in front of your two eyes instead of having to look down at a screen." Flynn said he has had no issues with the size of the helmet, and has been able to turn his head freely in the cockpit. But he reiterated that the F-35 is not designed for close engagements. "It's hard to imagine that anyone is ever going to jump up unseen and I'm going to have to fight my way out like I did in [a fourth generation aircraft]," he said. "If I find myself in a visual air combat scenario in an F-35, I have colossally failed to take advantage of the stealth capabilities and sensors." 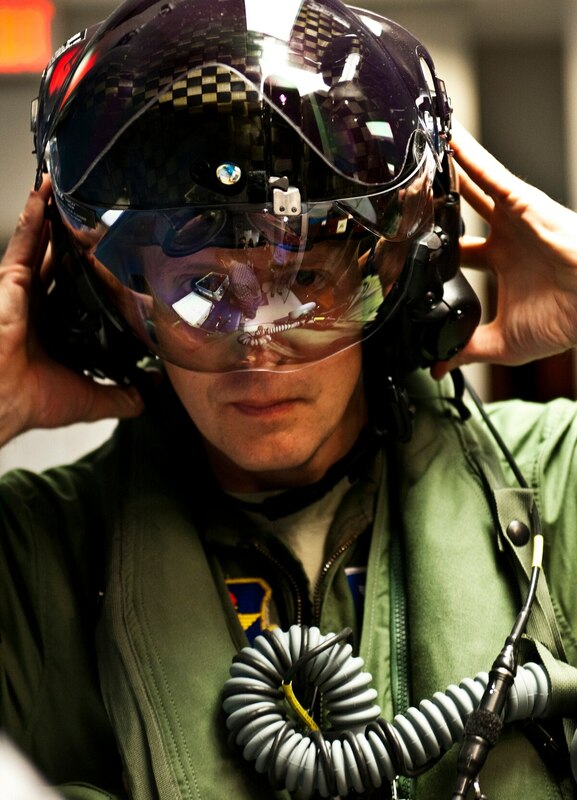 Col. Todd Canterbury, F-35 Integration Office operations division chief, said he agrees that the helmet is comfortable. "The helmet itself is very well balanced, so the center of gravity is more on top of my head preventing neck strain with all the additional sensors that I'm carrying," said Canterbury, a former Thunderbirds pilot who's logged more than 200 flight hours in the F-35. "I've worn the helmet for over seven hours in different sorties at Eglin [Air Force Base in Florida] and never did I have a hot spot develop," he said, using terminology for pressure points and other places on the head that can become uncomfortable during long flights. Canterbury said he's had no problems maneuvering in the cockpit with the helmet on. "Yes, the cockpit is a little constrained, but I've found that I can turn all the way around and look between the tails without adversely affecting the helmet," he said. "There is less space because of the large visor, and we're continuing to make improvements to that." The helmet and the capability it brings — especially the heads-up display on the visor — greatly aid in situational awareness and don't distract the pilot during critical engagements, he said. "This is the easiest airplane I've flown in 4,100 hours of flying fighters and I think the helmet really helps with that," Canterbury said. "I don't have to go hunting for information, it's right there. It's priceless, I don't have to take time searching for the information or distracting my eyes away from the target." The investment the Pentagon has made into the helmet is critical, Canterbury said. "It's worth every penny because we owe it to the men and women that are defending our nation — it's an all-volunteer force — to give them the best equipment that we have to keep them safe, survivable and lethal," he said. The Air Force F-35 will reach initial operating capability next year. Until then, the service is testing the aircraft and fixing anything found wrong, Canterbury said. "We're proud of the way the airplane is developing," he said. "She's got some warts, but we're exposing them and she's going to be great."